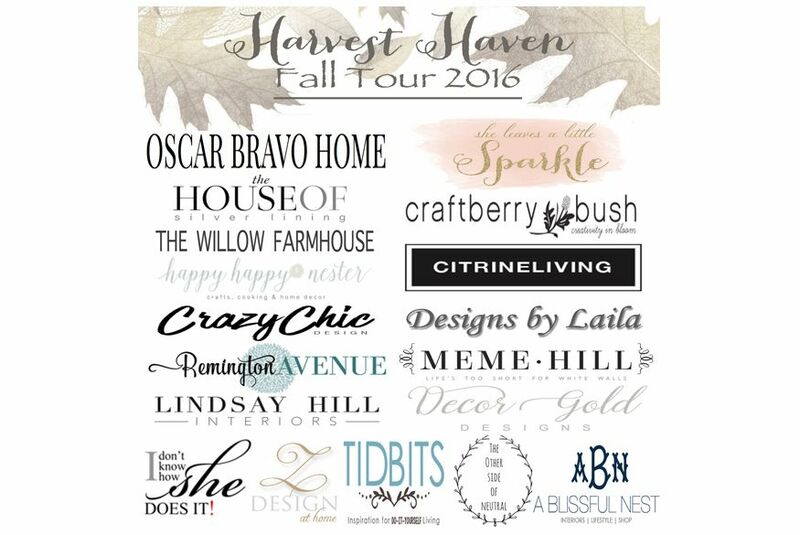 Welcome to my blog “I don’t know how she does it” and thank you for joining us today in the Harvest Haven Fall Tour 2016, hosted by Summer from “She Leaves A Little Sparkle“. 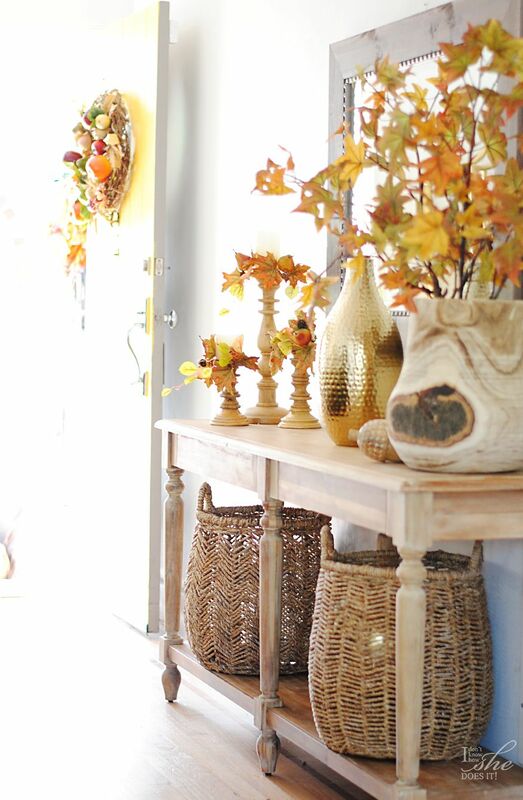 I’m so happy to have you here visiting from Zabrina’s amazing blog “Z Design at Home“. So make yourself comfortable and feel free to grab a PSL (Pumpkin Spice Latte) or cappuccino which I’ve made with love. During this season I usually love decorating with neutrals, but this year I went a bit out of my comfort zone and stared adding some colors but still with that warm feeling that I love so much about a neutral palette. At the porch I was able to add an urn planter that I’ve had for a while with a bright and iconic Mum. 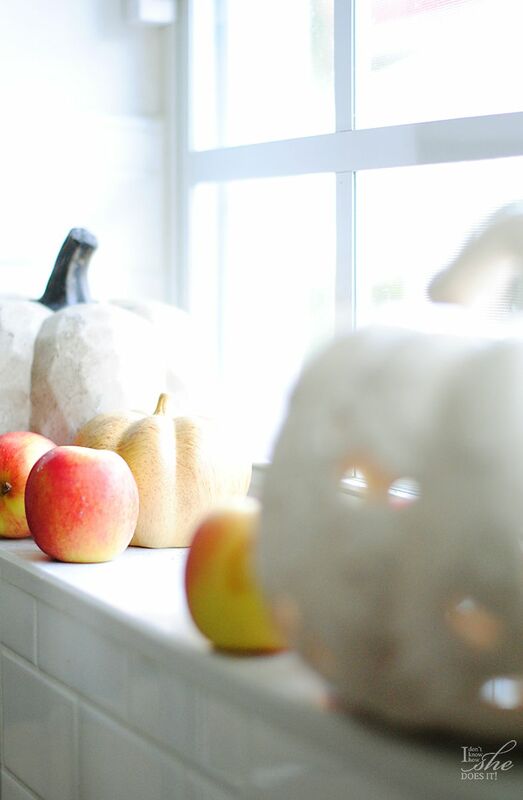 Since this area is small, I opted for grapevine pumpkins because of their light appearance. 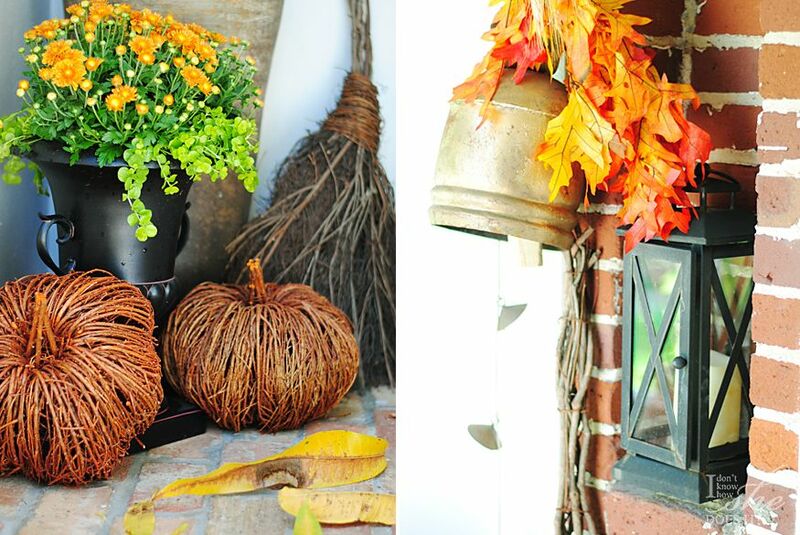 A small swag of preserved fall leaves I found at HomeGoods decorates my favorite nook in this 1938 house along a BHG Crossbar Metal Lantern I found at Walmart. 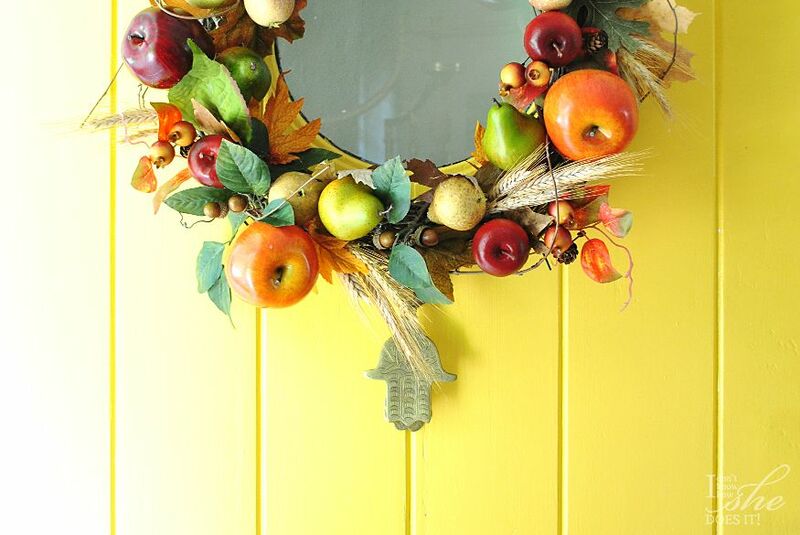 On our recently painted door I placed last year’s wreath which I updated it with bright foam apples, pears and some real and silk leaves. The contrast it makes against the yellow wall is amazing, wouldn’t you agree? This Everett foyer table I bought a while back at World Market is the perfect size and it’s really the first thing that greets my guests. 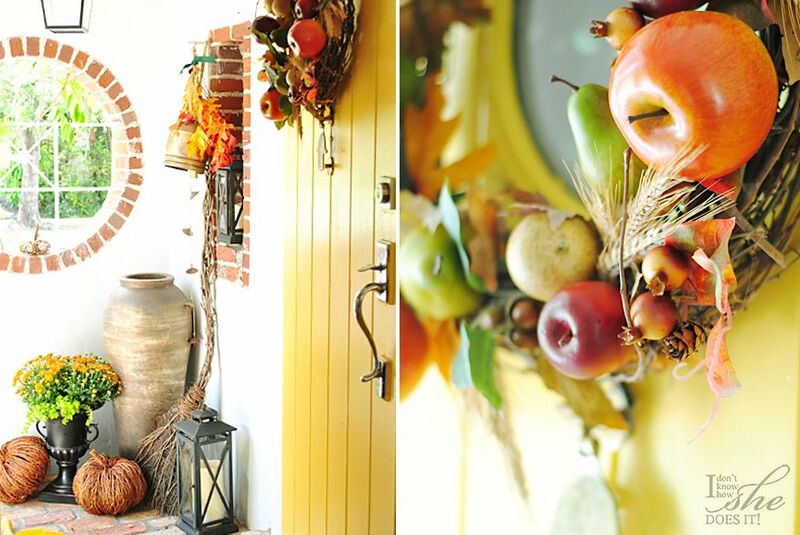 I like changing it’s look throughout the seasons always making sure it gives my visitors a warm welcome. 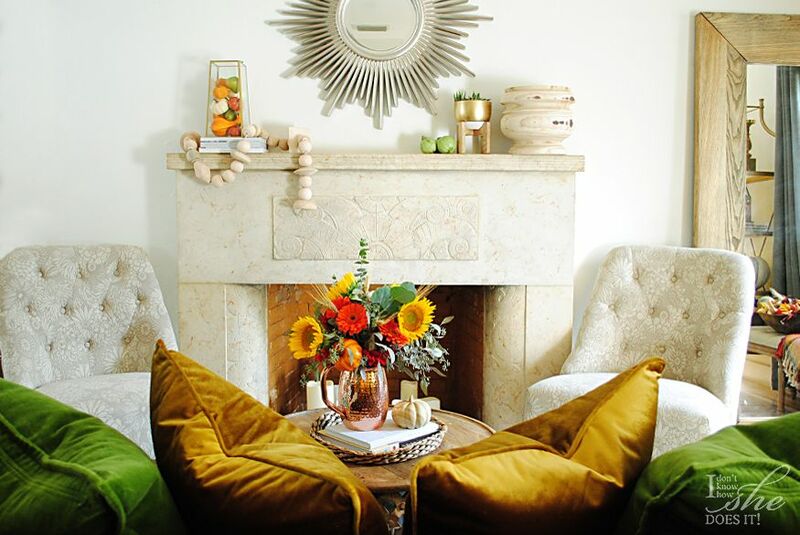 Our living room also had its dose of warm colors with suede pillows in ocher, hunter green and gold colors over the our Gordon Tufted Sofa from Home Decorators Collection. Again you can see how I managed to create areas of interesting contrast by playing with bright and dark colors. The flowers over the coffee also play an important role because they also add to the cozy and warm atmosphere I wanted to create. 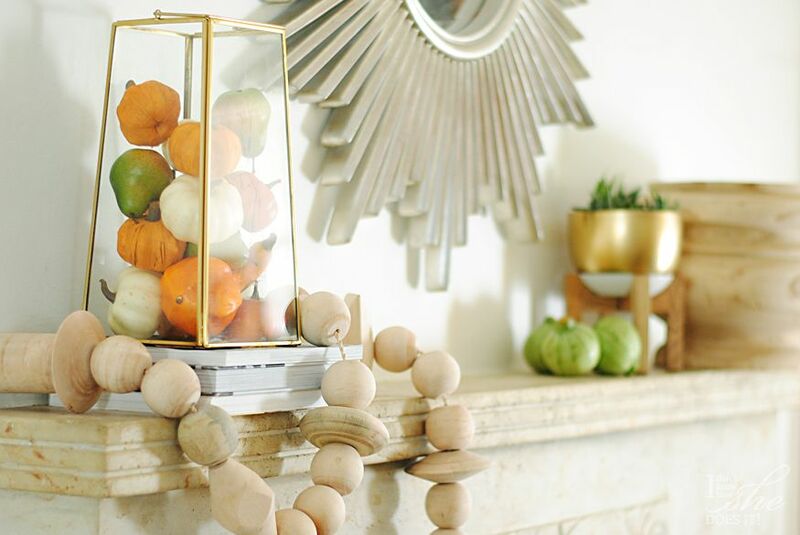 Over our mantel I kept things simple with textural elements in wood, but also added color by gathering some mix small foam pumpkins. Inside of our fireplace which has never been used since we moved here (and who needs it in Miami), I placed the Galiana Candelabra I found also at Walmart. At nights I love siting here and enjoy a quiet moment of comforting and relaxation. Setting the dinner table is always my favorite part specially during the holidays. This time I use a touch of metallic with some copper and golden accessories just to add a bit of elegance on the setting. Also I added some vintage inspired vases I found a while ago at Pottery Barn. Their Tuscan Terra Cotta collection is my favorite and mixing these surfaces with the metallic elements, brought another interesting contrast to our dinner table. 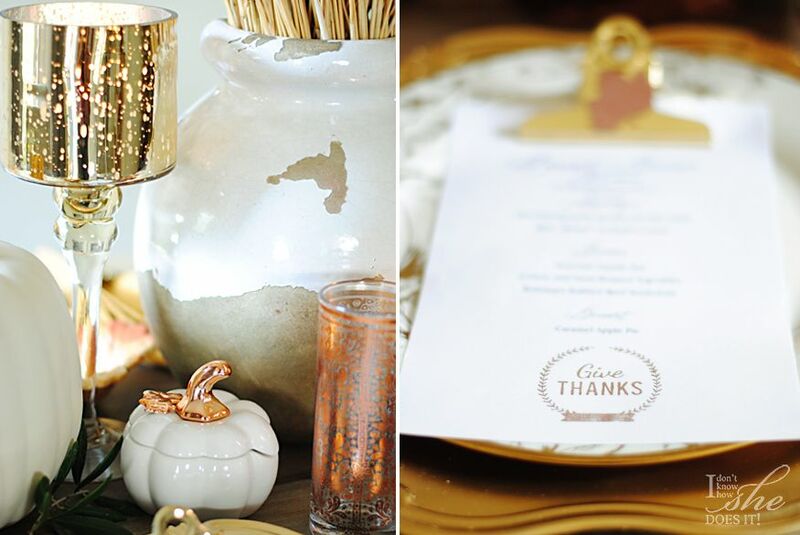 Accessories like candles holders, a menu, whimsical napkin rings, and pumpkins as decorative elements did all the difference when styling. 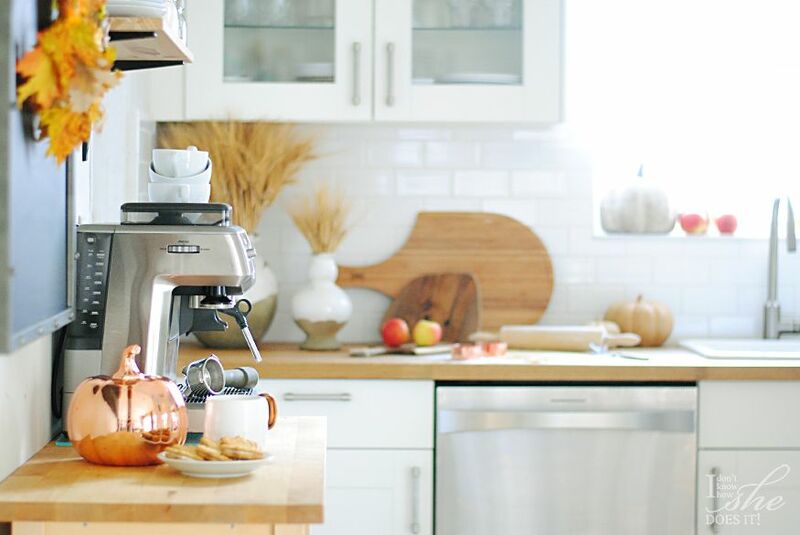 Moving along to our kitchen, I took the liberty of preparing on our Breville Barista Express Espresso machine a fresh cappuccino just for you. 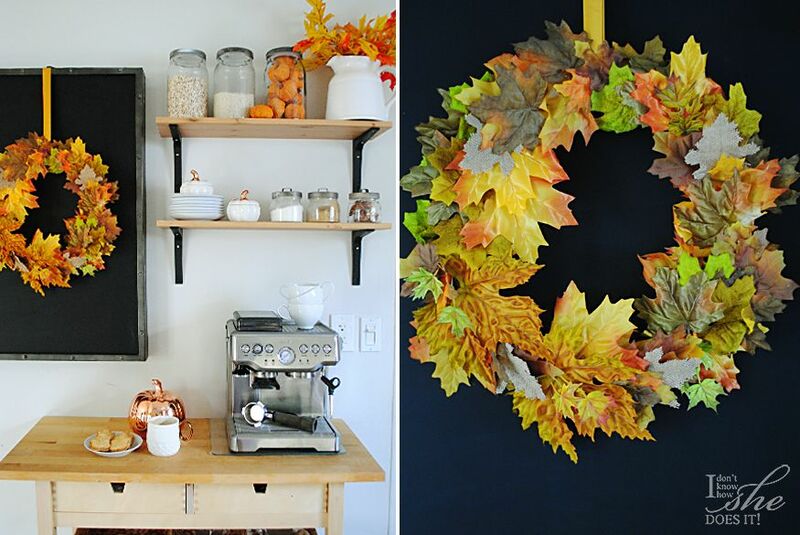 This area is our coffee station and depending on the season, I like adding small accessories that will give you a hint of what we’re celebrating. A simple wreath made with a metal hanger and a maple leaves garland from Joann makes that special statement over our Birch Lane blackboard. I also added some small ceramic pumpkin serving bowls with the cute copper accent on the top. 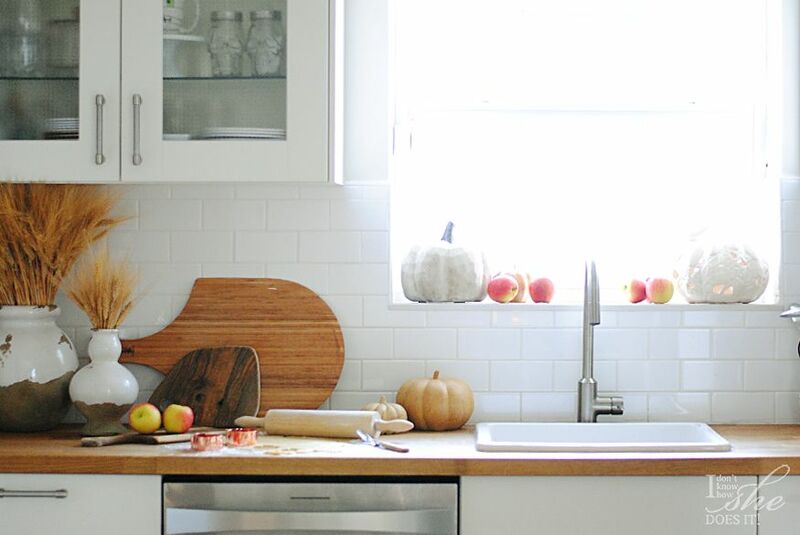 I have to confess, this is my favorite area in the kitchen! 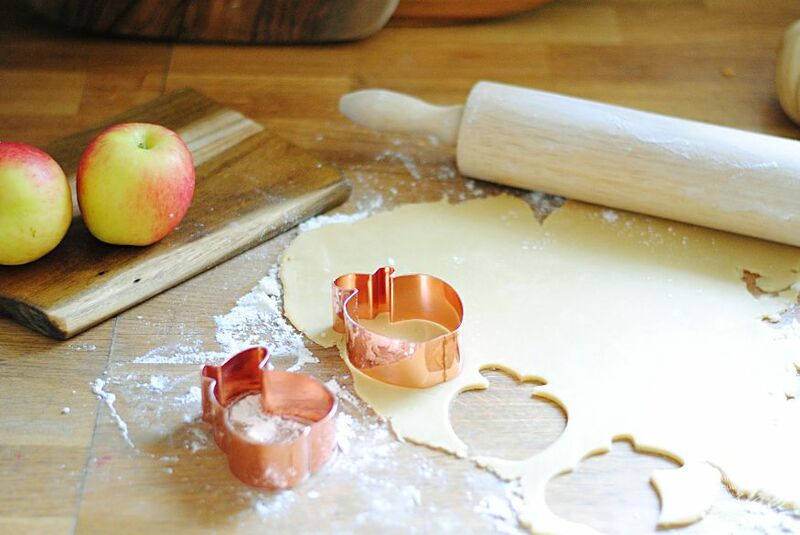 As you can see you caught me in the middle of some cookie baking and I’m using these super cute cooper cookie cutters from HomeGoods. The cookies will be ready in no time, so please feel free to wait for them; and while you do so, take a peek at those wooden and concrete pumpkins over our window sill. Simple is my middle name and these guys are all I need to bring in that autumnal. 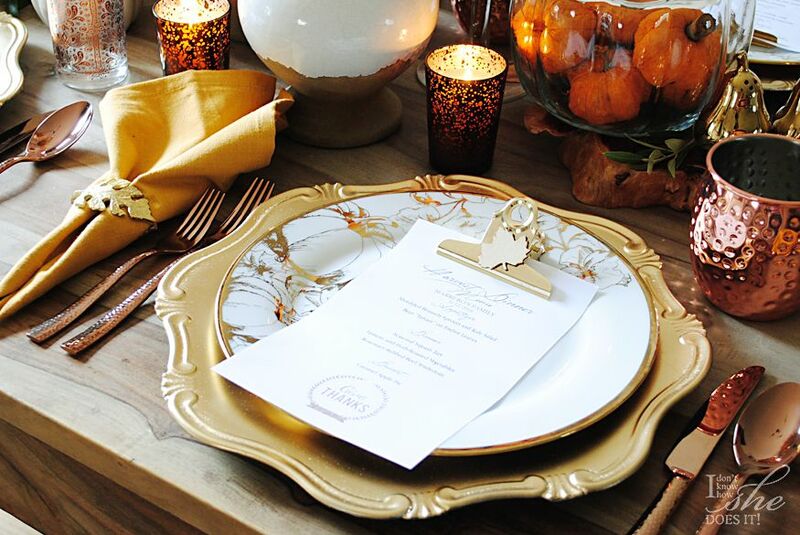 Oh your tablescape is stunning! Actually, every image was! Nice job. very cute, homey and very fallish..love the touches. Where did you get the little white pumpkin with the copper stem and leaf? love this. I just got some kind of copper warming thingy and want to add a bit to my table this year. I love everything, especially the copper! You style beautifully!!! I really love all of the color and it works so beautifully in your home! Gorgeous – thank you for sharing! Gloribell! Oh my goodness, I love your fall home!!!! You nailed such a gorgeous color combinations, you're so talented! Ok, now I have to read about your coffee techniques! LOVE this my sweet friend! Gloribell the colors are outstanding in your home!! I'm in love! And your styling of everything is spot on! Happy Fall! Gloribell your use of color is outstanding! And the styling on all your details is spot on! Happy Fall! Everything is GORGEOUS Gloribell! 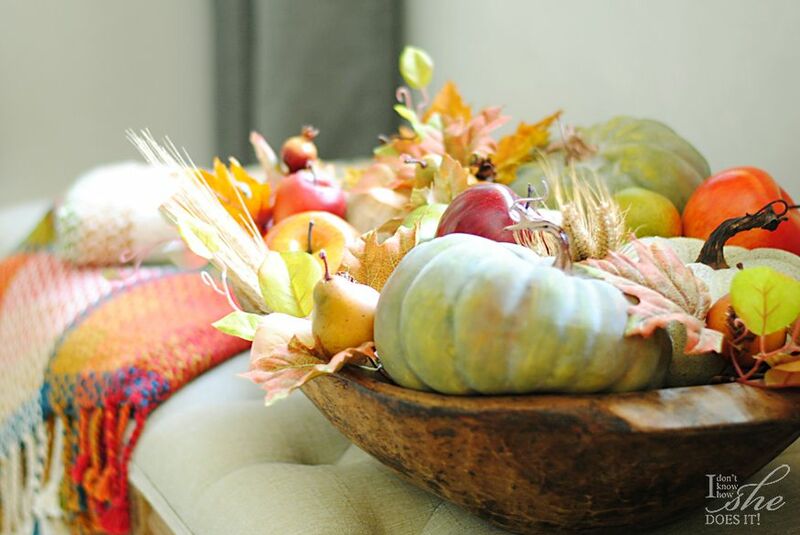 All the beautiful rich fall colors and those pillows on your sofa are my favorite! 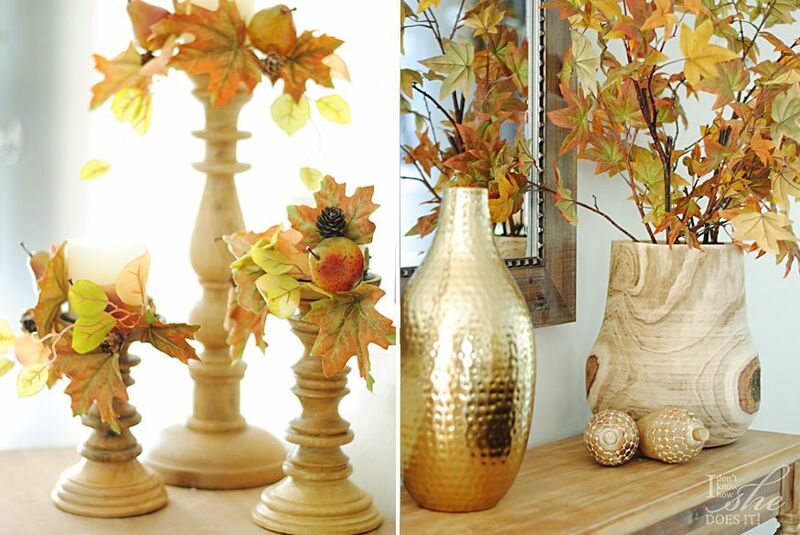 So fun touring your home with great decorating ideas for fall! 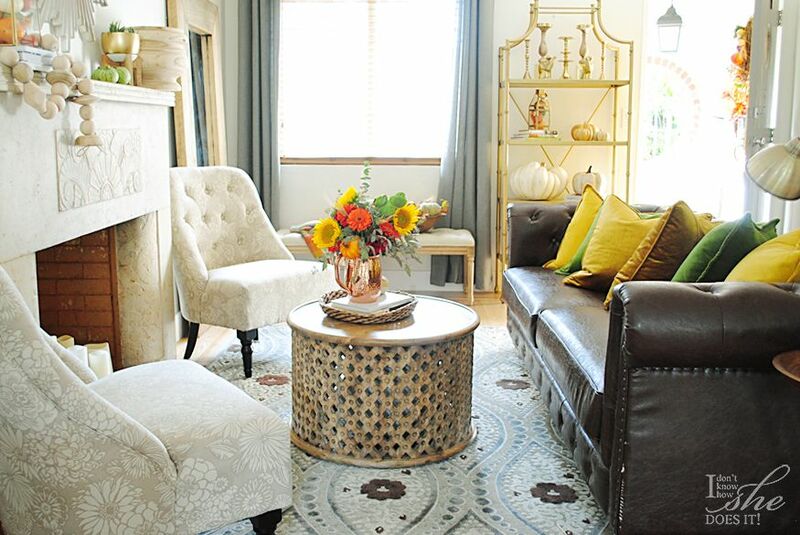 Wow how gorgeous your pop of colors are in your home! They are so rich and look incredible with all the texture you have in your home. Beautiful job! 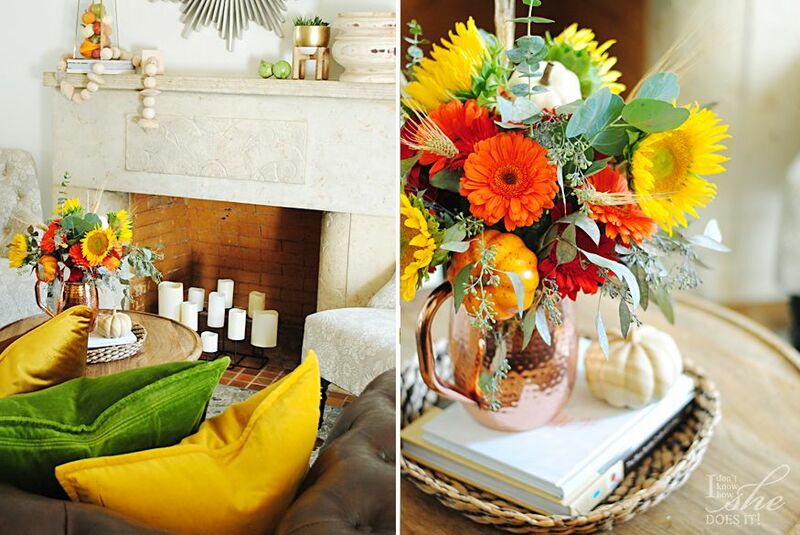 Gloribell, your gorgeous copper accents stole my heart! This is perfect for a Miami fall! You are so talented my friend! My friend! 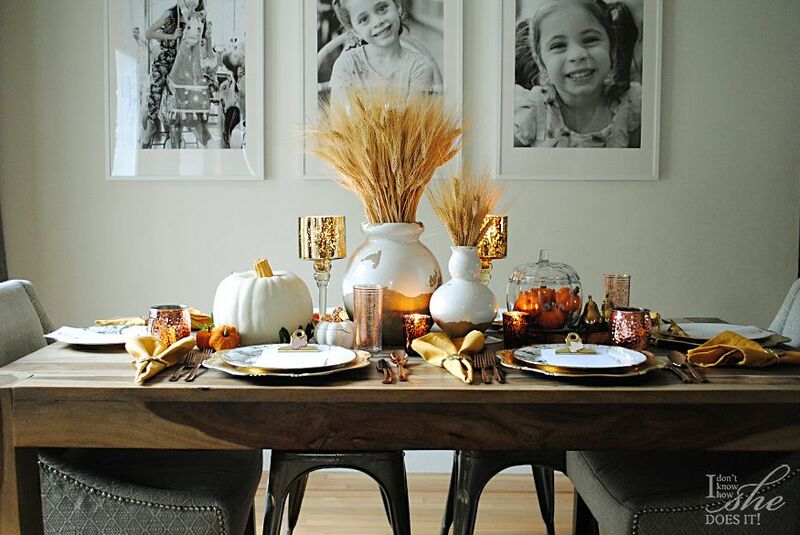 What a gorgeous fall tablescape! 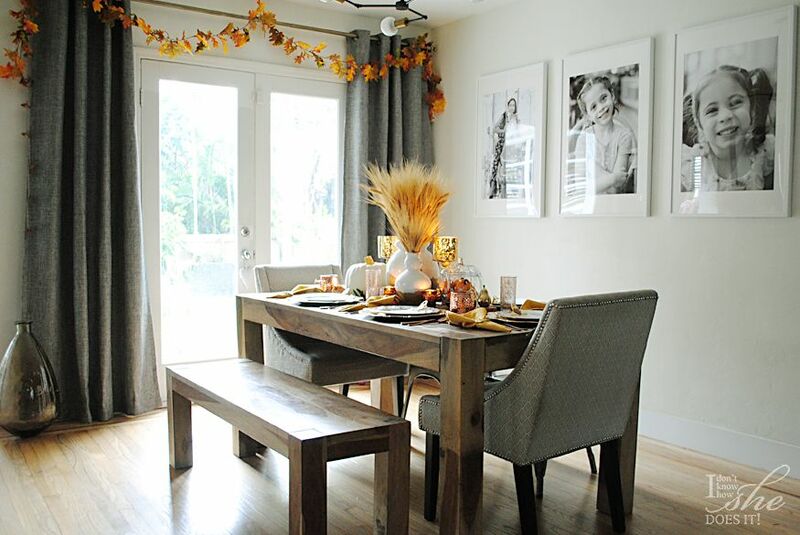 Love all the warm colors you used on the table and in your home! And I wish I could taste that yummy coffee! Thank you so much, Cami!I really enjoy taking these pics, Fall is my favorite season! I love adding that extra dose of shimmer in the table. It really upgrades the look without going overboard. Thanks for stopping by! Hi Gabrielle! Those pumpkins are from HomeGoods I wish I would've bought more at that time because now I haven't seen them again in stores. Hope this helps and thanks for visiting. Thank you Katie for stopping by! Thanks Jennifer. Copper seems to be my new "motto" LOL. Thanks for the lovely visit! Oh Summer, we had a blast and Shannon was so much fun!!! We really enjoyed our time in the Summit always wishing it lasted a bit more. Thanks for stopping by and for hosting this great tour! Thanks Janine. It was a real honor to join such an amazing group of talented bloggers! Thanks Jennifer! At least (an inside my home) I get to dream about cooler temperatures and crisps mornings, hehehe! Thanks for stopping by! Thanks Oscar, I really enjoy giving my style a twist in color. Oh, and you're more than welcome to come and visit for that cup of coffee. LOL. Thanks Tamara. I really enjoy your tour as well. Happy to have you here! Thank you so much Shauna! It seems like we have similar tastes when it comes to pillows. Love touring your home as well. Thanks for visiting! Thanks Rebekah. Fist time using this much color in my decor. It took some time to getting used to, but now I think I might have to try it again in another season. I appreciate your visit! Love that garland from Joanne's. The colors really pop against the blackboard. Good job! Thanks Liz! I've been saving that garland for a year now and can't believe I didn't used it last year. Love the color! Oh my goodness Gloribell!!! I'm in awe!! 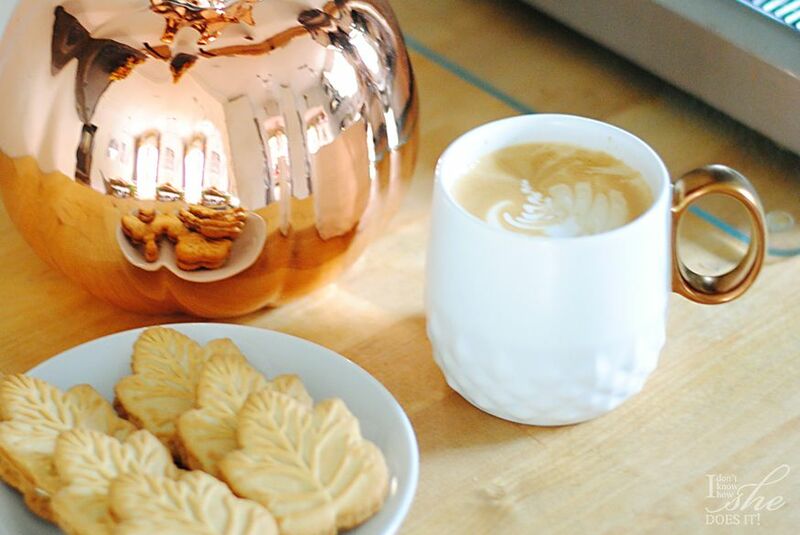 Ok, prettiest cappuccino and maple cookie leaves ever!! 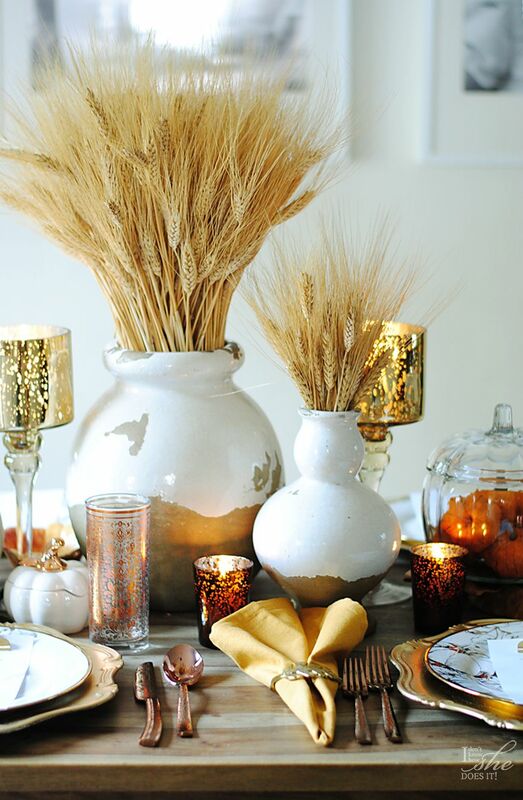 The copper touches, your gorgeous entry and table, the beautiful wheat….I'm just swooning over every detail! I'm honored to have you as part of this tour and thrilled you could do it before running off to the Michaels Summit! Have a BLAST!! (Just talked to Shannon and sounds like y'all are having fun already! 🙂 xoxoxo…. Your home is just gorgeous. Love the copper touches you added! This year I am all about the metals so this is definitely speaking to me! I adore your yellow door!